I remember that when I encounter this Chicken Stock ingredient in the recipe. I was a little bit confused on what to do. Good, that I have a wife who’s somewhat an expert in cooking told me that it is the water from the boiled chicken. 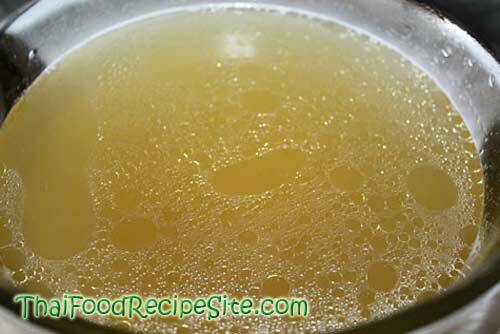 Chicken Stock usually boiled with other ingredient like celery, onion, and garlic so that the liquid will be flavorful. The vegetables and chicken are removed and collect the liquid in a container for used as a base for the soup. In this recipe, fats and oils are removed by refrigerating the it. If you find that making a chicken stock is a hard work, you can use bouillon cubes as its replacement. But base on my experience, chicken stock is much tastier and flavorful than a bouillon. In a large stock pot, combine water, chicken, lemongrass, celery, cilantro, onion and ginger. Bring to boil, skimming surfaces from unwanted fats if necessary. Do not stir. Reduce heat and simmer (with bubbles just breaking the surface) for 3 hours. Strain stock, cool and refrigerate. When cold, skim fat from surface. Stock can be refrigerated for 2 days or frozen for up to 4 months.